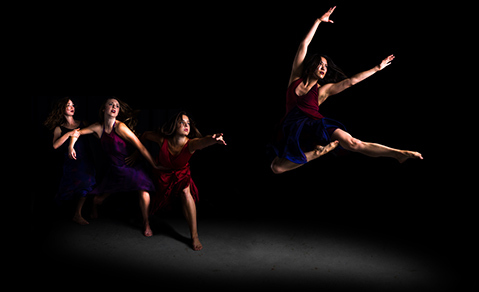 <b>TAKE THE LEAP:</b> PICTURED FROM LEFT: Nebula Dance Lab's Genevieve Hand, Meghan Morelli, Megan Ragland, and Weslie Ching. The company, spearheaded by choreographer Devyn Duex, is the launching pad for Duex's new HH11 Dance Festival, which takes place this Friday-Sunday at Center Stage Theater. With HH11, Devyn Duex is realizing a long-term goal to mount a dance festival in Santa Barbara — a festival with a name that is a play on stars and star-stuff, just like Duex’s dance company, Nebula Dance Lab. (HH 11 is the name of a star-forming region.) “Part of Nebula’s mission statement is about supporting emerging choreographers in the dance world. There’s such a need for platforms to get work produced. Finding all the resources is really difficult,” Duex said. Her aim in creating this first HH11 Festival is to provide a venue for both seasoned and emerging dance artists. In past years, Misa and Stephen Kelly, joint founders of an artists’ collective called ArtBark, have produced multiday dance festivals in Santa Barbara, providing dance artists from all over the world with opportunities to bring their work to our little seaside town. The Kellys are taking a break from festival production as Duex realizes her dream — excellent timing for the 30 or so groups (more than 75 individual artists) participating in the three HH11 shows taking place at Center Stage Theater. The first two programs are evening-time affairs on Friday-Saturday, March 27-28, with the third offered at as a matinee on Sunday, March 29. Artists include S.B.’s own BodySensate, Weslie Ching, Tonia Shimin, SELAH Dance Collective, and The Dance Network; from Los Anegles, San Francisco, and other parts of California are FUSE Dance Company, JESSICA KONDRATH | THE MOVEMENT, Keith Johnson/Dancers, Kelly Todd, Kendra Pearson, Louise Reichlin & Dancers, Project21Dance, Rebecca Bryant Danceworks, Rubans Rouges Dance Company, Strickly Addikcted Dance Theater, and Watson Dance. New York artist Michelle Tara Lynch and Iowa’s Anna Krupp are also participating. Two dance films by Tonia Shimin, award-winning dance filmmaker and professor emeritus of the Department of Theater and Dance at UCSB, will be presented: “Of Time and the Spirit” and “Of Stones and Water.” For the festival, Shimin has also crafted a solo work for Christina Sanchez, a member of Santa Barbara Dance Theater and much-loved and respected area dance instructor and performer. The dance, “A Walk With Modigliani,” is a world premiere celebrating the work of Italian painter and sculptor Amedeo Modigliani. Duex is especially grateful to the sponsors who have helped make the festival possible: the Santa Barbara Travel Bureau, which is handling all of the travel associated with the event, Strategic Incentives, IM=X Pilates, CenterPoint Pilates, Boone Graphics, Heritage Oaks Bank, Downtown Santa Barbara, and California Pasta. The HH11 Dance Festival takes place this Friday, March 27-Sunday, March 29, at Center Stage Theater (751 Paseo Nuevo). For tickets, information, and showtimes, call (805) 963-0408 or visit centerstagetheater.org. For more on Devyn Duex and Nebula Dance Lab, visit nebuladance.org.